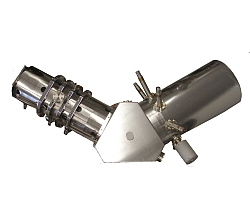 Our aberration corrector is an electrostatic tetrode mirror. It has been developed entirely by Elmitec and it is the first commercial aberration-corrected microscope to demonstrate an improved lateral resolution. The first instrument was installed at the Dalian Institute of Chemical Physics, The Chinese Academy of Sciences (Prof. Bao), in 2009. 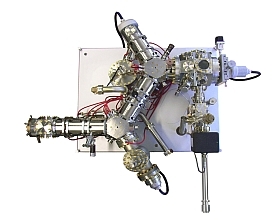 The mirror works in combination with two beam splitters separated by a transfer column. The mirror can be tuned to generate aberrations compensating those of the objective lens. In this way a consistent improvement in lateral resolution and transmission, thanks to the larger contrast aperture, is achieved. Measurement of the width of a rotational domain on Si(100). Field of View 750 nm. The image has been taken during the factory acceptance tests.